Air Niugini’s subsidiary company, Link PNG’s flight PX 900/901 on 29th May 2015 goes down in the history of the airline as the first all women aircrew took to the skies of Papua New Guinea. 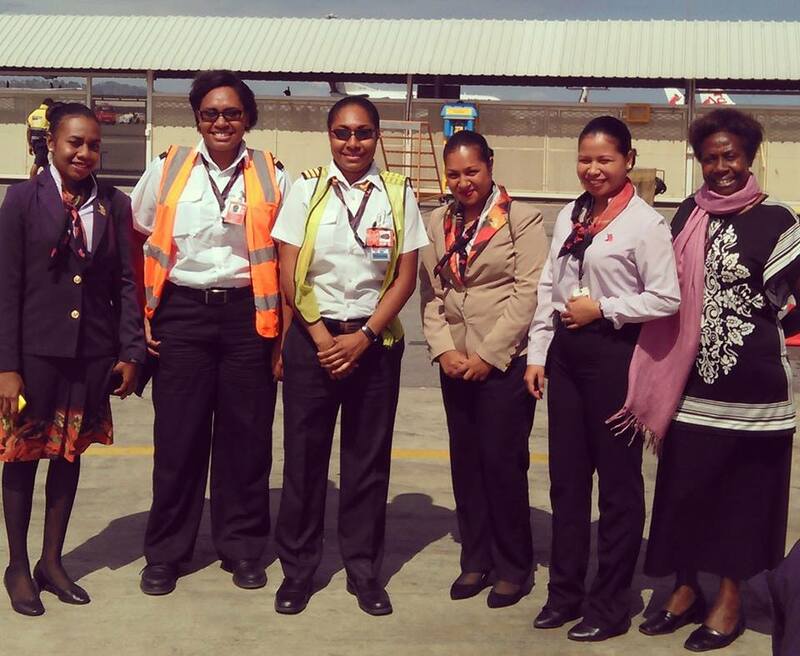 A crew of five led by Captain Beverly Pakii, First Officer- Nicole Koleala and cabin crew- Julie Tamdodo, Ulato Avei and Veapi Ranu departed Port Moresby’s Jackson’s airport on a schedule flight to Tabubil and back. Whilst they may feel this flight should be recognized like every other schedule flight, there was something peculiar about this flight from others they had flown- it was the first time an all-female Link PNG crew flew a schedule flight- all Papua New Guinean. It was a milestone achievement for the airline and the women of this country. The flight was the first for Link PNG whilst second for its mother company, Air Niugini which had a similar flight four years back under the command of Captain Bona Yasi and her crew. Their flight may have been the first for the country, if not the region. Link PNG Chief Executive Officer, Daniel Wanma said it’s a milestone achievement for the women of this country, adding that these girls have gained a different perspective. “Working in a male dominated profession, it is certainly exciting to find all female crew serving our customers and providing the same high quality standards as dictated by the company. Given the successful program many more girls will be joining their ranks well into the future.” Wanma said. Onboard PX 900/901was another female Air Niugini employee, Ms Elizabeth Talum. Elizabeth works as PX Cabin Standards Trainer, prior to that she was a member of the cabin crew on the international sector. Elizabeth was on duty when she observed this unique scenario and had to ask a friend to capture the photo of the girls on her mobile phone upon arrival in Port Moresby. Captain Pakii broke another record early this year when she became a first young Papua New Guinean female pilot to have achieved her command on a Dash 8 aircraft under Air Niugini’s pilot cadet program. The 29 year olds achievement is the first for the airline since Air Niugini’s pilot cadet program started in the 1970s. Other female Air Niugini pilots who may have achieved their commands on the various Aircraft type, did so but through other pilot program, which means they may have achieved their command whilst with Air Niugini, however they did their cadet program elsewhere. For both Pakii and Koleala, flying with Link PNG may not be something new as their connection with the mother company, Air Niugini goes a long way. Their fathers were former Air Niugini pilots- Captain Ted Pakii and Captain Nat Koleala flew Air Niugini’s Fokker 27 and F28 in the 1990s. For the all women crew on PX 900/901 on 29th May 2015, they may agree that it’s an experience they’ll remember throughout their flying career, to be able to say they did, if only once. Not that it is better, it was just different, and probably won’t happen again for some time. Their story represents a changing industry and a realistic growth in gender diversity- these girls have truly gained a different perspective.